The Jesters Club was founded in England in 1929 by a schoolboy, Jock Burnett, to promote the enjoyment of court games. The games included Real Tennis, Rackets, Squash, Eton Fives and Rugby Fives. Today, the Jesters Club is an international club of squash players and other sportsmen, with headquarters in London, England. The club is dedicated in large part to the organization and promotion of squash throughout the world and the encouragement of the game at its most sporting best. The club is centered in the United Kingdom with autonomous clubs in the United states, Canada, South Africa and Australia. 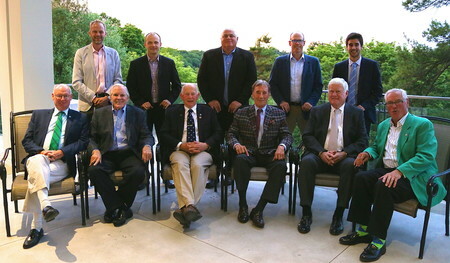 The Canadian Chapter was founded in 1948 and is comprised of five regions; Atlantic, Quebec, Ontario, Western and Pacific. There are approximately 400 Canadian members. In the early 1930s, trips to play squash across the Atlantic began to take place. These, of course, were of an unofficial variety and really only a group of friends going one way or the other, combining business with pleasure. Between 1932 and 1936, five Canadians were elected members of the U.K. Jesters. In 1934 the U.K. Jesters toured Canada and the United Stated. In 1934 the Americans reciprocated and were all elected members of the club. Canada formed a separate organization in 1948, and the size of the Club grew along with the development of squash in this country. In 1957 the South African branch of the Jesters Club was formed and tours between the U.K., Canada, United States and South Africa have been a regular occurrence.